Some things are just too good not to share. This video is one of them. It encourages us to get mammograms. That's good, too, although not why I posted the video. Watch it; I'm sure you'll understand my why. One other good thing I want to share: a blog called The Gimpy Girls: Solutions for Baby Boomers, the Disabled and the Just Plain Lazy. That's where I found this video. Now I'm looking for time to read more of the blog. Healthy Weight Loss: Is It Harder for Women to Say No? The headlines were abuzz last week with results of the latest study that 'proved' women are at some sort of biological disadvantage compared to men. This time, it's whether we're able to resist our favorite foods as easily as men can. The study, published in the Proceedings of the National Academy of Sciences, presented 13 women and 10 men with their favorite foods after a 20-hour fast. They were allowed to smell and taste the foods but not eat them -- indeed, to try to inhibit their desire to eat -- while their brain activity was monitored through a PET scan. The result: Both the women and men did appear to succeed in making themselves feel less hungry but the brain scans showed more activity on the part of women. This was interpreted as the women's brains not being entirely in sync with what the women thought they were feeling. That they were actually feeling more hungry than they thought. Or something like that. To answer that question, my BIG question is: Was there any attempt to look at the women's previous history of restrained eating? You know, the typical (unfortunately) woman's approach to eating -- "I would love it, but I shouldn't." "I need to lose X number of pounds, and if I eat my favorite food -- which is high in calories, fat, carbs, etc., etc., I'll be fat the rest of my life, be a bad person, etc., etc., etc." According to one thoughtful expert in this area, who shall remain anonymous until I can get her permission to quote her (which I should have done before now but oh, well), "It is well-known that people who are trying to restrain [that is, diet] have different responses to 'external' stimuli about food [that is, exposure to food -- you know, like, walking through the mall smelling the Cinnabons], and it is well known that more women diet, and have dieted, than men." Simply put, if we have a history of dieting, which almost carves the diet mentality into our brains, it's gonna make it harder for us to say no to food, especially that which we think we shouldn't have. A BIG caveat: If we are successful at again adopting mindful eating (or intuitive eating or attuned eating or normal eating -- you choose the term) -- that is, eating like we were born to do -- I doubt we'd show any more brain activity than men when faced with our favorite foods and told we can't eat them. Because we are no longer restrained eaters. So there is hope that we don't have to be forever victims of our previous folly of dieting. Just my thoughts on the subject. :-) Have a great day!! Many of my friends have started off the year with the best intentions of following through with their New Year's resolutions. A few have vowed to lose weight, others to stop a bad habit. I checked in with them recently to ask what progress, if any, each of them had made. The friends of mine who had started on fad diets were not doing so well and had mostly given up or had switched to a different 'quick' weight loss program. The only woman who was being successful with her weight loss goal had slowly adding new habits, or slightly changed old ones. For example, she started walking a couple times a week, slowly increasing the duration and frequency. Now she walks almost everyday for at least a half hour. "I couldn't have done it every day right off the bat," she related. "But my philosophy is taking baby steps and not setting the bar too high." Another friend had decided to cut out going through fast food drive-thrus - not necessarily to shed unwanted pounds, but to start a more healthy eating lifestyle. He didn't stop eating fast food altogether, but simply modified his behavior. "If I'm going to have a burger and fries, at least I'm going to walk for it!" he explained. Now he finds that he makes healthier choices for his meals, even when going to a fast food joint. I'll bet many of you reading this post can see yourselves or your own friends in these examples. Let us know how you're doing on your own resolutions (if you've made any). How are you doing? Have your goals been realistic? Are you struggling? Tell us about your experience! Fat prejudice cuts across all races, socio-economic levels, and genders (although women face far more fat discrimination in general). Overweight people are often subject to public ridicule, but there are more insidious, subtle, and illegal forms as well, especially when it occurs in the workplace. "Body mass significantly decreases women's family income," a study by two researchers at New York University found. "However...men experience no negative effects of body mass on economic outcomes." If you think that, in today's PC environment, state legislatures would have adequately addressed weight discrimination in the workplace by now, think again. 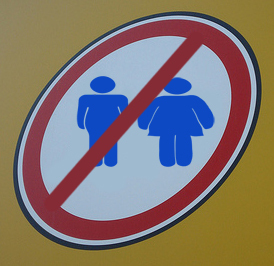 The BigFatBlog claims to have a 'complete' list of states/cities where this type of discrimination is illegal and, if accurate, is discouragingly short: Michigan, San Francisco, Santa Cruz, Washington. The Council on Size and Weight Discrimination's goal "is to end weight discrimination in health care, media, education, employment, social interactions, and many other areas of life." Their website offers an excellent list of resources for victims of discrimination, or people looking to support their mission. "A man can't ride your back unless its bent." Keep the dream alive for all people! Become empowered. If you feel you are the victim of weight discrimination, know your rights. If you want to help end this pervasive prejudice in today's society, try changing your own attitudes and speaking up when you see examples of discrimination around you. For more information, take a look at other weight neutral / fat acceptance websites and blogs such as the National Association to Advance Fat Acceptance or Health At Every Size. Healthy Weight vs. Normal Weight: Who's to Say? I had such a hard time deciding on a post topic this morning. There are so many good/important things to post about. What finally won was another discussion of Oprah's weight. But no salacious comments here. The question at hand is not Oprah's up-and-down battle with serious weight loss but the measure by which many of us define success. Is it the government's definition of 'normal,' which is defined by the body mass index? Or is it a weight at which we feel well, function well, and at which a variety of health parameters (such as blood glucose or cholesterol) tell us we're doing fine? For a great discussion of this, check out the article by Paul Campos, author of The Obesity Myth, in Rocky Mountain News. If you can get on board with this, I vote that we all give up talking about our weight (and weighing ourselves -- toss out that scale!). If we want to talk, let's discuss our healthy lifestyle habits instead. Positive = Forward. Admittedly, I'm late in coming to the the Sunday 8 pm (EST) Style network show called "Ruby," which began in November 2008. The first episode I watched was this past Sunday, and I have to say I was intrigued to learn more about Ruby Gettinger, her issues with obesity, weight discrimination, and healthy living program to lose weight. The charismatic Gettinger was inspired to create a documentary based on her own personal journey towards permanent healthy weight loss. She has faced serious health problems such as type 2 diabetes and an enlarged heart, and had repeatedly - and unsuccessfully - tried over and over again to lose weight over the years. Through the Style television program, Ruby Gettinger now works with a team of professionals to help her reach her goals, and has already lost 10 percent of her body weight, which greatly reduces risks associated with type 2 diabetes. On the whole I think the program is a hopeful, entertaining, and enlightening program, especially when confronting issues of obesity and weight discrimination and the difficulties in changing one's eating behavior.